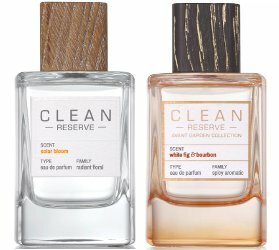 Clean has launched Solar Bloom and Avant Garden White Fig & Bourbon, two new fragrances in the Clean Reserve collection. Solar Bloom ~ a 'radiant floral'. "Inspired by dawn’s radiance as warmth begins to caress the skin. The fragrance glows with vivid citrus accords while a buoyant, solar bouquet blooms at the heart, adding a vibrancy to the earthy tones of charcoal and sensual coconut water." In Eau de Parfum, $28 for 10 ml or $98 for 100 ml, at Sephora. White Fig & Bourbon ~ a 'spicy aromatic'. "...inspired by the allure of a night's lunar eclipse when darkness and light unite. It is the combination of this rare and unlikely pair that arouses an intoxicating intrigue. Luminous fruits and white fig cast a breathtaking radiance over a heart of aromatic spices, while luxurious bourbon vetiver and warm woods wrap the fragrance in a smooth, full-bodied richness." $150 for 100 ml Eau de Parfum at Bloomingdales.